The art object Torn and Cut is a parallel to Derrida's work Glas, in which I find his work both literary and artistic, conceptual and creative. 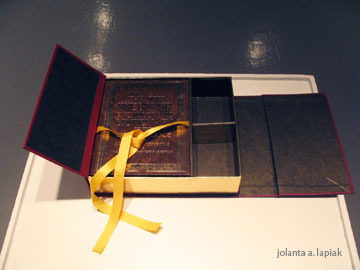 "Aside from [his] literature and philosophy, my works inspect the logocentric demarcation between art and literature. I seek to blur them into literary art and artistic literature, a twining between criticism and creativity." A viewer might overlook a detail of this work, in which the pieces of paper on the left side are torn by hand, whereas the pieces on the right side are cut by scissors. 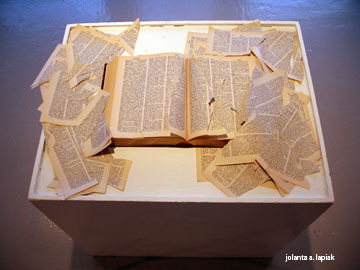 "The work Torn and Cut illustrates a metaphor of disrupting the boundary line between philosophy and literature. The dictionary in its neutral role contains vocabulary. 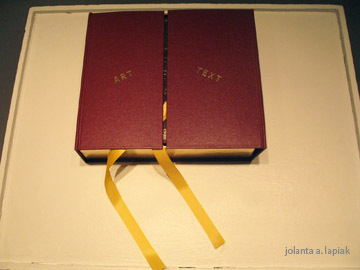 The words in the disinterested dictionary can be rearranged into a philosophical text or a literary/poetic text within the same space (between the hard covers - front and back). The torn pieces reflecting philosophy represent logos (interiority, speech, thought) since those pieces were torn by hands. On the other hand, the cut pieces representing literature reflect writing, since scissors, like pens, are the extension of the body. Yet, in the end they are made of the same materials, and same words can be rearranged into philosophical or literary texts." "Derrida breaks down the border between literature and philosophy in his work, Glas, which presents complementarity of philosophy (all cited philosophical text by Hegel), literature (all cited literary text by Genet), and art (cleverly creative rearrangement of text by Derrida). He "exploited all manner of stylistic or performative effects for the sake of deconstructing the type-cast distinction between 'literature' and 'philosophy', along with those between reason and rhetoric, concept and metaphor, literal and figural meaning, etc." (Norris, p 136) For Paul de Man, the distinction between literature and criticism is rejected." "Then if philosophy, literature and art are part of the discourse of criticism. Criticism is an activity of (arche)writing and (arche)reading critically. It opens up multiple interpretations through deconstruction, a way of reading. Norris puts, "this amounts to a downright refusal of the system of priorities which has traditionally governed the relation between 'critical' and 'creative' language." This criticism is not without creativity as Derrida's Glas demonstrates."